Get the who, where, what, and how much of recent US EPA enforcement actions for violations of air, water, chemical, and hazardous waste regulations. . The point is, your employees are stressed, and it is affecting your business. But what can you do as a manager to combat stress in the workplace? From March 10 to March 16, Watershed Ambassadors rallied AmeriCorps alumni and members of the public to transform their community through cleanups, plantings, workshops, and more. Volunteers successfully carried out half a dozen programs. Experience fully-engaged training that does more than meet relevant training mandates. Reserve your seat now for hazardous materials and hazardous waste management training workshops in Spring 2019. 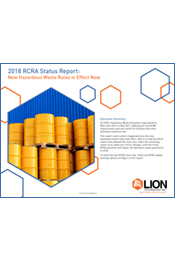 By thinking critically about how you manage commerical chemical products (CCPs) at your site, you can optimize your ordering, use, and disposal practices to prevent these chemicals from entering RCRA’s jurisdiction in the first place. PHMSA snuck a new marking/labeling requirement for excepted lithium batteries shipped by all modes (including ground shipments) into its HM-224I lithium battery "harmonization" Interim Final Rule, in effect as of March 6, 2019. US EPA has kicked off its prioritization process for performing risk evaluations of forty chemical substances, as required under the amended Toxic Substances Control Act (TSCA). In the Federal Register on March 21, EPA posed a Notice to inform stakeholders of the chemicals up for possible review. We bring you the who, what, where, and how much of recent EPA enforcement actions to help you identify and correct common causes of environmental noncompliance.